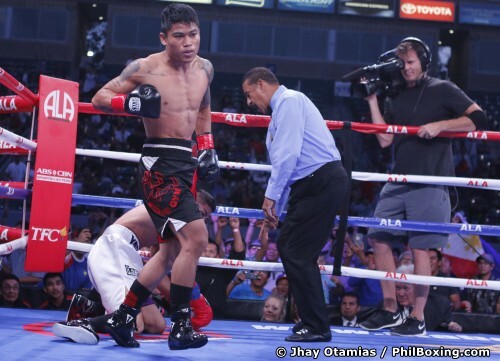 STUBHUB CENTER – During Thursday's press conference, the then undefeated Mexican Yardley Suarez promised that he will knock out Filipino rising star Mark 'Magnifico' Magsayo in the second round. Unfortunately for Suarez however, he didn't reach that round as the Filipino speedster who's got power in both hands finished him off at exactly 2 minutes in the first round dropping the Mexican two times to the canvas with rapid fire combinations to the delight of a sizeable pro-Filipino crowd Saturday night here in Carson, CA. 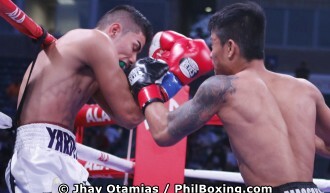 Magsayo retained his IBF Youth Featherweight title and improved his undefeated record to 12 wins with 10 knockouts. Suarez suffered his first defeat in 14 starts.